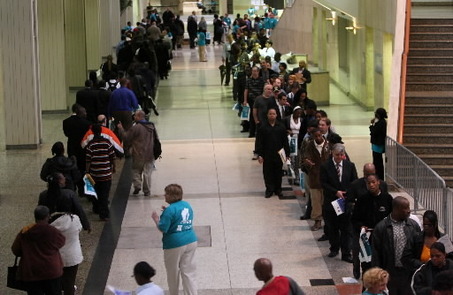 If We’ve Gotten All The Jobs Back, How Come We Don’t Feel Better? The U.S. economy has finally recovered the staggering 8.7 million jobs lost during the Great Recession. Looking back, we can see just how brutal this recession really was, and what a deep pit we’ve clawed our way out of. “The economy took more than six years to recover its previous peak level of employment,” says the Wall Street Journal. That’s almost double the time it took after the 2001 recession and triple the time needed after the 1981 and 1990 recessions. That helps explain why the overall economic recovery has been so slow. The economy can’t recover if people don’t have money to spend. But if we’ve gained back all those jobs, why don’t we all feel better? This was truly a brutal recession that caused unbelievable damage to millions of American families. It was the deepest since the Great Depression and the slowest to recover from. The chart showing the depth of U.S. job losses compared to previous downturns is truly staggering, and is worth taking a look at to appreciate what we all somehow endured. The U.S. economy is still struggling to create higher-wage jobs. We may have gotten the jobs back, but they’re not the same jobs we lost. Compared to January 2008, jobs in construction are down 20%, manufacturing 11.7% and banking 4.8%, says the Los Angeles Times. In real numbers, that’s a loss of over 1.6 million jobs in manufacturing, almost 1.5 million jobs in construction, and .5 million jobs in government. Those generally higher-paying jobs were replaced with lower-paying jobs in health care and social assistance, food service and accommodation, and temp help. Low-paying positions at restaurants, hotels and temp agencies now account for a greater percentage of the workforce than those in higher-paying fields such as construction, manufacturing and banking, says the LA Times. That all has an impact on what consumers have available to spend. The job market has failed to keep up with population growth over the last 6 1/2 years. 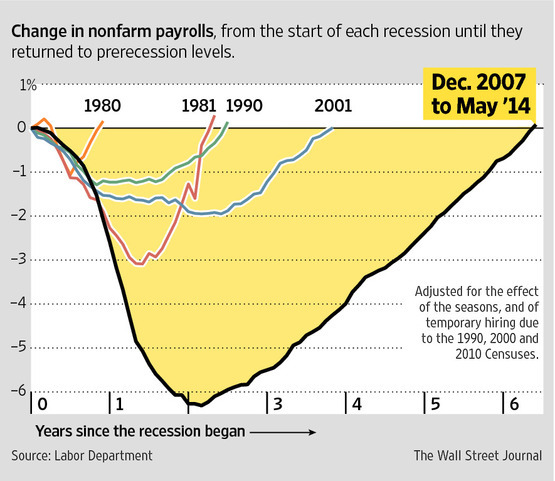 It’s true that we’re back to the same number of jobs we had in January 2008, when the recession started. But due to population growth since January 2008, the economy still is about 6.9 million jobs short of where it should be, says Heidi Shierholz, a labor market economist at the Economic Policy Institute, when interviewed by the Los Angeles Times. “At the pace we are currently going, it will take nearly four more years to get back to pre-recession labor market conditions,” she said. Americans are earning no more than they were when the recovery started. We’ve heard it all before, but once inflation is taken into account, the typical American is making no more than in 2009 when the recovery started. Regaining the lost jobs is just the first step; now it’s time to translate that into higher earnings and a stronger financial position for American consumers. Some people have given up looking for work. The percentage of the population in the labor force (e.g. working) is at its lowest level since 1978. Some say that’s a sign that many people have given up looking for work, making the unemployment rate look lower than it really is. Others say that due to demographics and the aging of the baby boomers, more people are simply choosing to opt out of the workforce. Employers still complain they can’t fill available positions with qualified candidates. Education still pays off in spades. Employers say a “lack of qualified candidates is holding back hiring.” More qualified and educated people are much less likely to be unemployed and much more likely to be hired back (those lacking a high school diploma or a B.A. are more than two times more likely to be unemployed than their more educated peers).